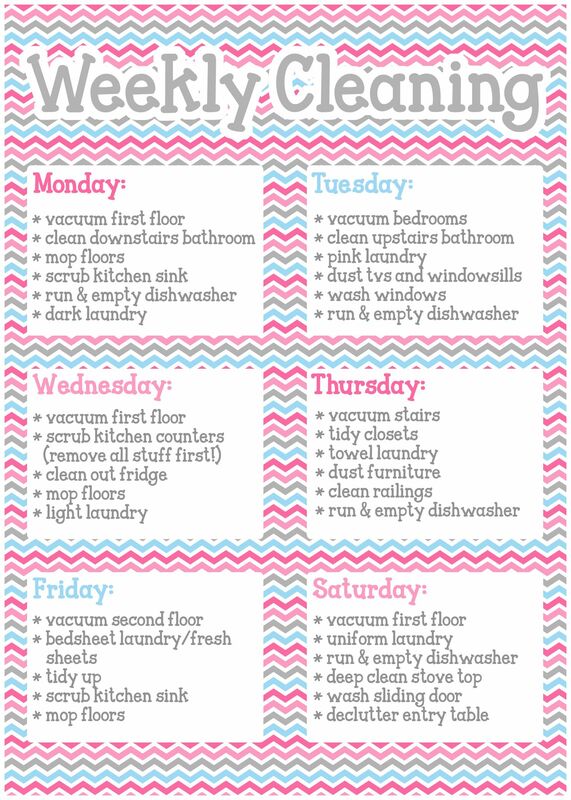 Cleaning Schedule – Is There Such a Thing? I’ll be honest, I actually find cleaning to be therapeutic. I don’t know where this came from though. If you saw my room when I was in high school you would have never guessed that I’d grow up to be a fairly ridiculous neat freak. Now, I find cleaning to be a way to clear my mind. Cleaning is pretty mindless, but it also keeps me busy so I can’t languish in my thoughts. As I’ve transitioned from full-time student to full-time career woman and wife, I’ve found that it has grown increasingly difficult to maintain my neat freak status usually because I am just so exhausted after a long day at work or have too many things going on after work that I can’t even start winding down until 8 or 9 at night. So, I switched to spending full Saturdays or Sunday cleaning, but those were no fun either because I felt like I was giving up a part of my weekend and not spending it with my husband, friends or outside. I started reading blog posts that boasted about the ingeniousness of cleaning schedules. 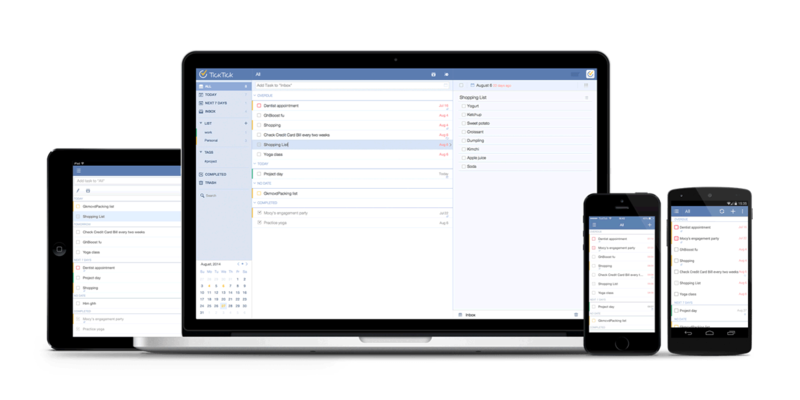 Since I live and die by my Google calendar and to-do lists, I thought switching to some sort of cleaning schedule would help alleviate the stress it takes to manage a household, and be able to more easily split up chores with my husband. Thus, my cleaning schedule was born! Many of the online cleaning lists that you see, like the one below, are usually quite vague and they are not meant to suite individual cleaning personalities or particular homes for that matter. Obviously, larger homes require more dedication and time and to maintain. It took me a few tries to get the optimal routine down, but I feel like we have a great cleaning schedule going now. I utilize an app called TickTick, which is hands down the best to-do list app EVER. I’ve been using it for around 6 months, and it has never failed me or bugged out on me. I used to use Swipes, and while I found it to be quite great, I noticed after a few months of using the app that my recurring tasks would disappear after popping up 5 or 6 times. It was infuriating because I’m relying on these recurring tasks to pay bills on time or remember to do something at work that I thought of the night before. But, TickTick has not failed me. My favorite part about the app is that there are a thousand different ways to schedule recurring tasks, which allows for so much flexibility. This flexibility is perfect for cleaning tasks. TickTick is great for my cleaning schedule. One day I sat down and wrote down all the cleaning tasks I could possibly think of around our home, such as when to clean out closets, clean behind the fridge, wipe down appliances, etc. Once I had all the tasks laid out I figured out how often these tasks should be completed by analyzing our use of each area of the home and how dirt accumulated in certain areas of our home. For example, our living room is the most used room of the house so furniture gets wiped down at least once a week and the same goes for vacuuming or spot cleaning the rug. Large tasks meant for year-end like cleaning out closets and donating old clothes are yearly tasks. I’ve spent time tweaking the schedule as I’ve gone through it but the schedule has been great! Keeping track of when I need to clean things utilizing a to-do list app has eliminated full days of crazy cleaning and has freed my mind completely from thinking about when I last cleaned something or when I need to clean it again or just thinking about cleaning in general. It’s so much more automated now. If I need to clean something I get a to-do list notification and take care of the task. The schedule has also helped me maintain a clean home because I’m regularly cleaning and there is less chance for dirt and dust to build up. I have around 2-3 three cleaning tasks scheduled a day except for Sundays, and some of the larger tasks are scheduled for a Friday or Saturday. Even with the cleaning schedule I still maintain order by doing certain tasks daily no matter what like washing/putting away dishes, wiping down kitchen counters and picking up clothes/random items. If you hate cleaning, but like a clean home I highly recommend setting up a cleaning schedule. And even if you love cleaning, a schedule really helps maintain a home without much thought!